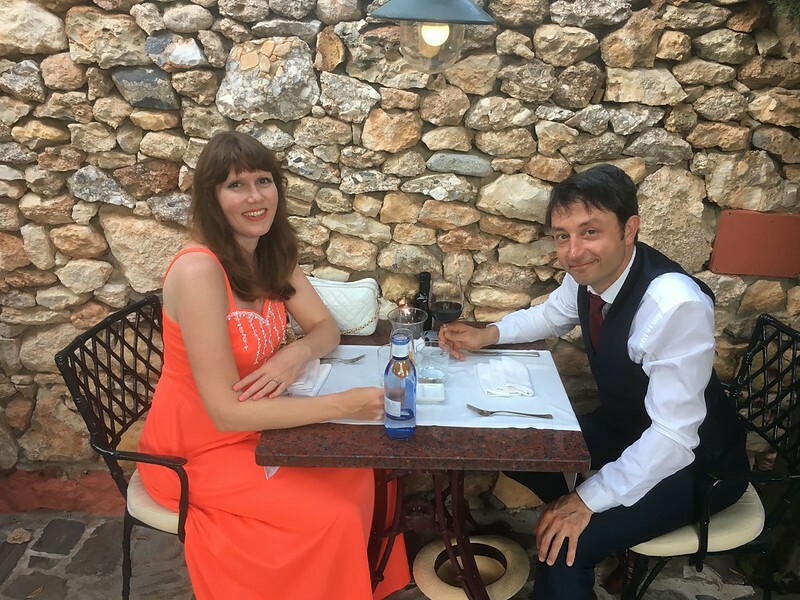 It's become a tradition each year to have a late summer holiday in Spain for my husband and I, and this year was no exception. A whole week of sunshine, tapas and rather good wine in the lovely town of Nerja. This isn't my usual 'what I wore on holiday' post. Full-on relaxation mode was much needed this year (PhD writeup is hard! ), and this meant that I didn't do a single outfit 'shoot'. I was having too much of a good time, sorry! 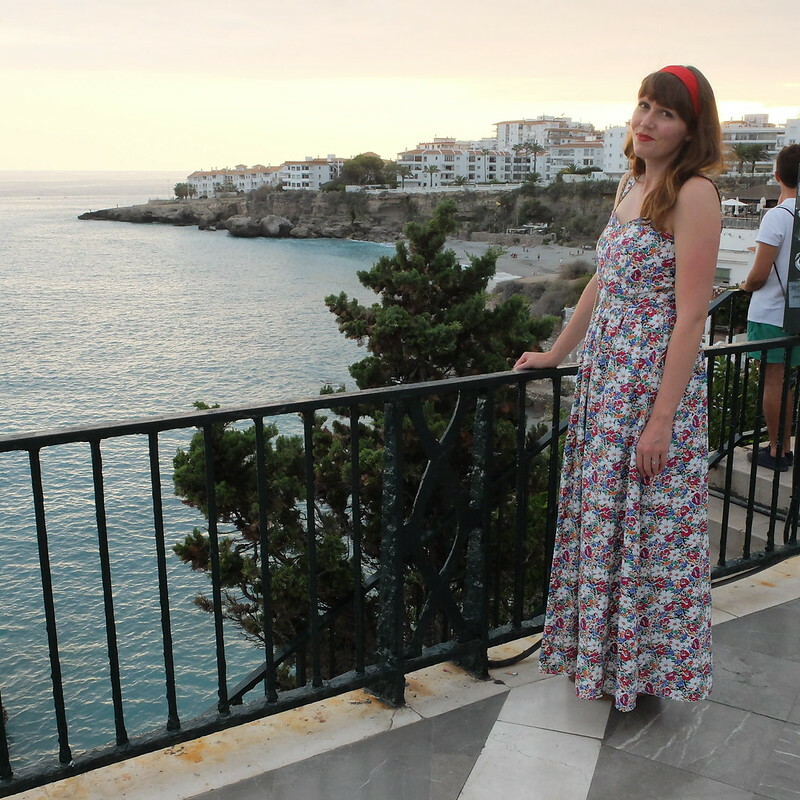 Instead I'm sharing a few sparse images of two special vintage dresses that I wore for the first time whilst away. 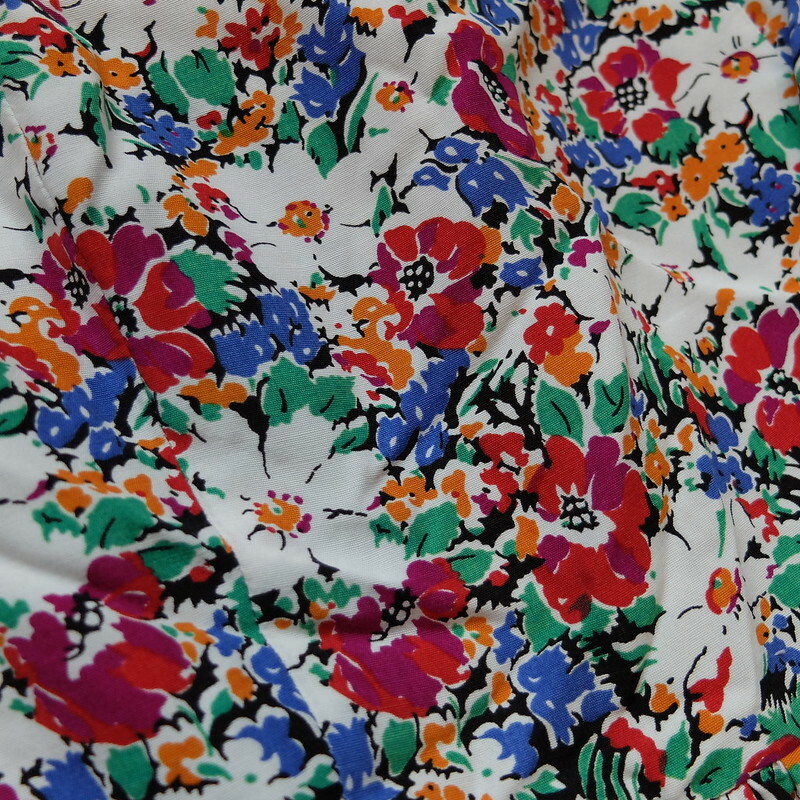 Vintage dress #1 - a Marion Donaldson floral cotton maxi dress, from the late '80s/early '90s. I wore this dress for an evening of bar-hopping, tapas and wine. Our favourite place to drink wine and eat tapas is the amazing Pata Negra 57 restaurant. 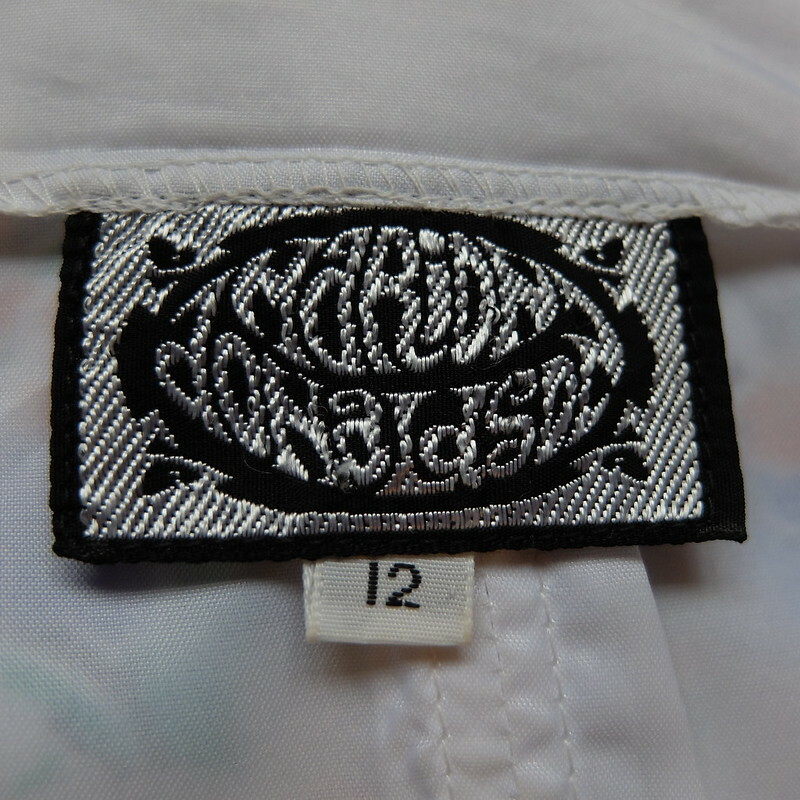 Marion Donaldson was a Scottish designer, credited with bringing London's swinging style to Glasgow in the 1960s. The brand helpfully changed the colour of the name label each decade: purple in the '60s, brown in the '70s, then gold on purple (late '70s? ), and finally silver on black in the '80s until it ceased trading in 1999. It was a £9.99 bargain from a charity shop in Andover. This dress was pretty tight around the top of the ribcage for me, so I had to do some unpicking and restitching to get a bit more room in there. Someone had also turned the hem up so I let it down again. It took ages, but I'm so glad that I did it and the dress now fits so I can wear it with reasonable comfort. I wore it with some brown wedges from M&S, a red headscarf, red lips and a charity-shopped bag. Vintage dress #2 - a Carnegie of London neon beaded maxi dress, from the late '60s/ early '70s. While we were away, my husband and I celebrated 10 years together, and our 2nd wedding anniversary. We celebrated at a favourite posh restaurant, Restaurant 34, and such an occasion demanded a unique frock! This Carnegie of London dress was £10 from a market stall in Cardiff. It's a bit big on me, especially in the bust without a padded bra (which I didn't take on hols with me), but it does make it great for a sit-down dinner. 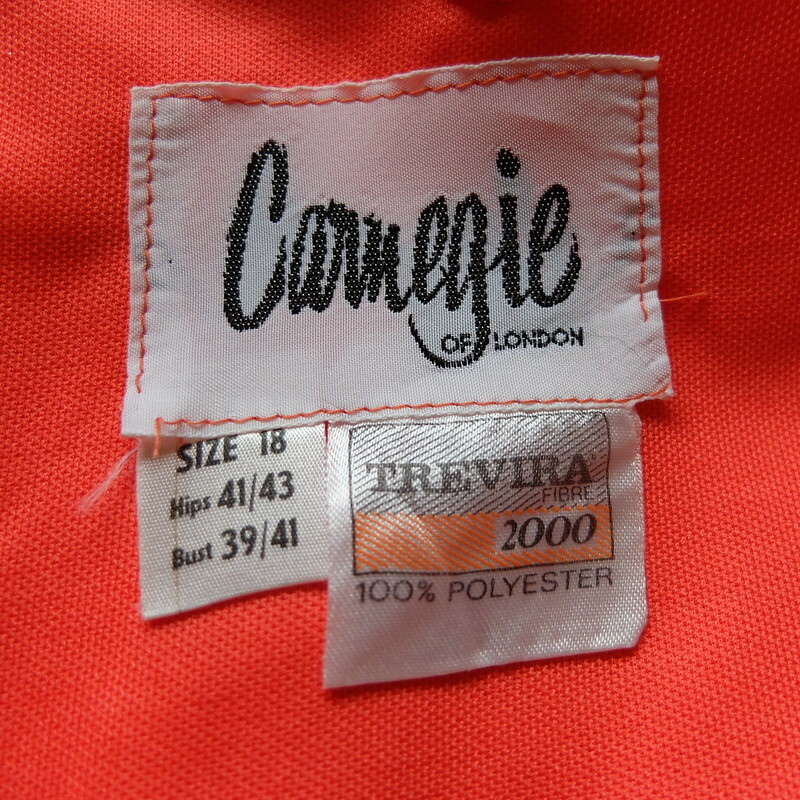 I don't know anything about the brand, all it says on the Vintage Fashion Guild website is that it's not to be confused with the Hattie Carnegie brand. Someone is selling a navy version of this dress in a larger size on Etsy if you're interested. 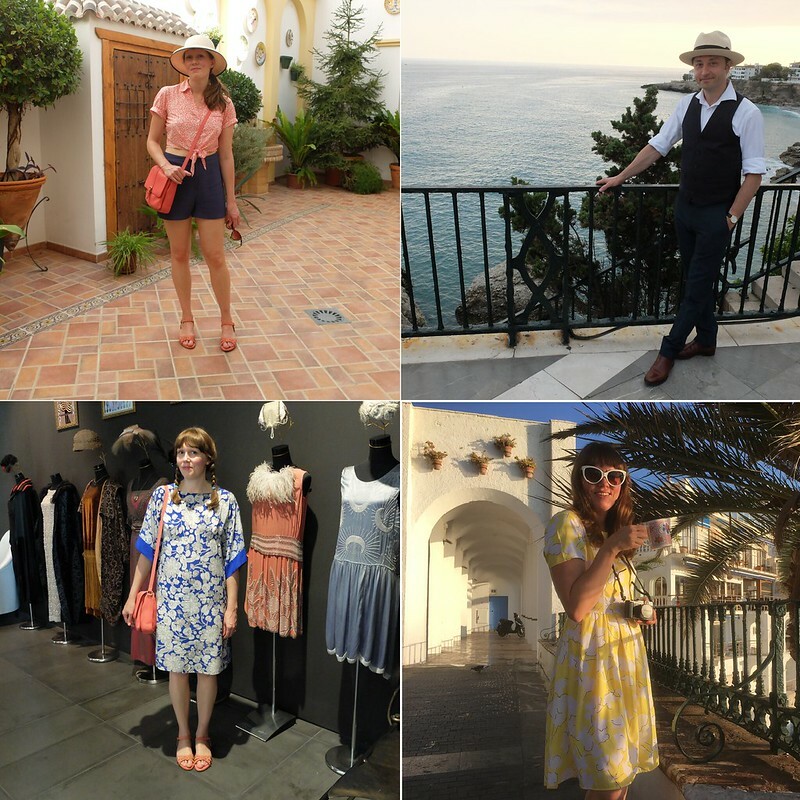 Much of my holiday wardrobe remains the same as previous years, with favourite pieces worn over and over. That probably doesn't make it as interesting for you. My other *new* outfit of the holiday was a new Biba at House of Fraser cobalt blue bikini, bought in the sale. I felt AMAZING, I was on the roof terrace of our boutique hotel one night relaxing on a Balinese bed, popping in and out of the plunge pools, drinking cava and feeling like a goddess. There is no photographic evidence of this - let me warn you all that blue light does NOT work for photos! Nor should you attempt a photoshoot after drinking cava... Ah well. I felt fabulous, that's the main thing isn't it? My husband was quite the dapper chap while we were away too, he loves his Christys' vintage panama hat and wore it day and night. 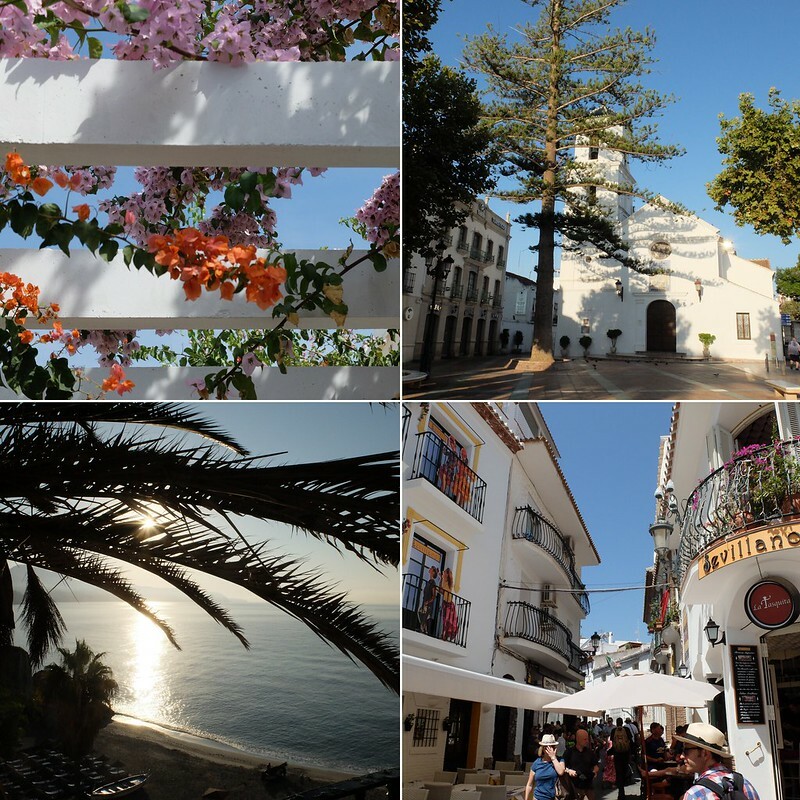 Clockwise from top left: beautiful flowers, the main square of Nerja, winding streets of the old town, and dawn at the beach. Previous years' holiday outfits available to view: 2016 evening wear, 2016 day wear, 2015 honeymoon wardrobe, 2014 holiday wardrobe, 2012 holiday wardrobe. Wow, it’s been a while since we visited your blog for the last time. So glad we found it again! We wish you a wonderful Sunday! It's my first Trevira! I don't know much about it, I'd love to learn more if you have the inside information! Vacay is meant to be enjoyed : ) I'm glad you did just that...all the while both of you looked amazing! That orange maxi is stunning on you! Your description of wearing the blue bikini and boozing on the roof terrace sounded like utter heaven. Who needs photos with a description as powerful as that? Two gorgeous dresses - you look wonderful in both of them. Timelessly stylish and completely unique. Funnily enough I bought a Carnegie from what must have been the same collection last week - turquoise and one shouldered with the same embellishments. Those outfits are lovely and you look so beautiful in the photos. I went for a looooong time not having a holiday too, but I've now decided it's an integral part of my wellbeing and that I must have at least a week of guaranteed sunshine a year!! Hi Porcelina, this is my first visit to your blog and what a lovely time to drop by! 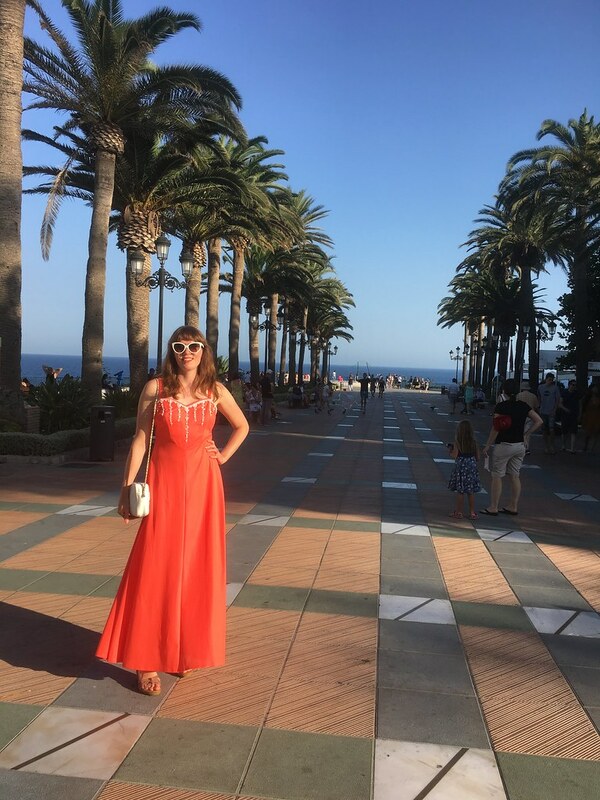 Looks like you guys had a great holiday and I do love that orange maxi dress - it's right up my street. Thank you for stopping by Anna! It looks like you had an awesome vacation! 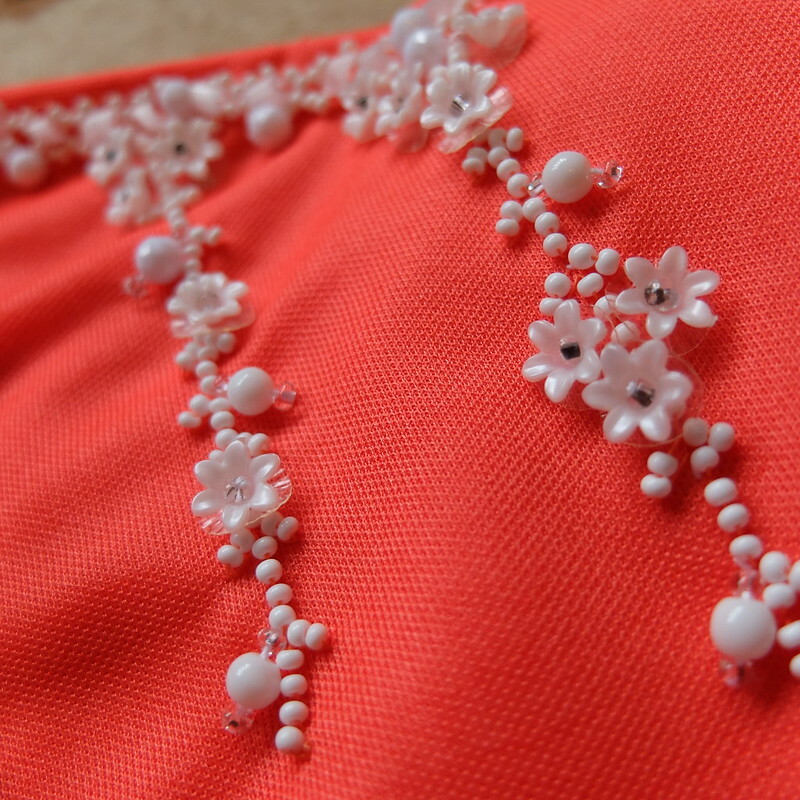 You look so cute in all of your different dresses - they are absolutely perfect for a holiday in the sun. Congrats on your 10 year anniversary! Congrats on the anniversary and I think you're one of the best dressed tourists out there. The first dress is my favourite, the print is so colorful. I could not see it from a distance. Thank you Lorena, you're very sweet! It's a lovely print isn't it? I want to wear it again soon but will have to find a way to make it Autumn appropriate!! Both stunning dresses for your vaca and celebration. I don't blame you for packing them in a carry on. I haven't flown for a long time, but can't imagine how I'd feel if an airline lost my luggage full of irreplaceable vintage dresses. A horror I dare not contemplate! Yes, it's a scary thought isn't it? Especially as the vintage items aren't ones I've gone out and bought overnight, they've been collected painstakingly over many many years! Your holiday wardrobe is so light and elegant! I love the pieces you brought, and your tunic and the Marie Donaldson are especially lovely vacationing outfits! I'm so excited to see more of that museum too- it looks amazing! I will post about the museum in the next couple of weeks, there was so much wonderful stuff! Oh, those dresses are lovely. How helpful of them to keep changing the label colours in that way. I didn't take any original vintage this time. I actually managed... a capsule wardrobe! No idea how that happened. It was nice not to think about clothes for a week, though. Spain is such a great place to go on holiday at this time of year. You look absolutely fantastic in a maxi dress! And although it is a relaxed garment, it is also super chic! I'm glad you enjoyed your holiday and had some time to chill out and relax.